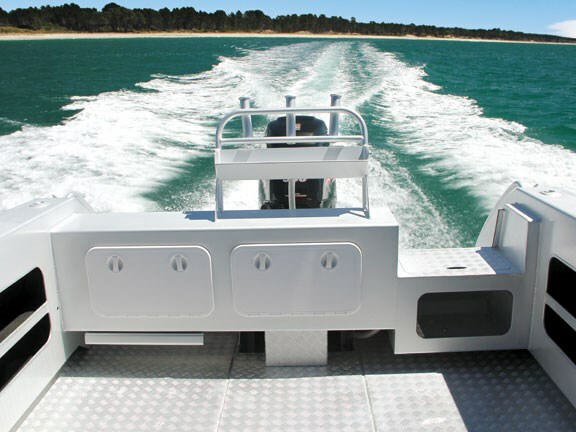 As New Zealand’s most awarded aluminium trailer boat manufacturer for the last five years, Extreme Boats is clearly doing something right with their products. 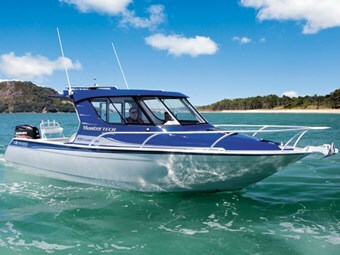 Less than 15 years into production, the Eastern Bay of Plenty's Extreme Boats has cut a swathe through the New Zealand trailer boat market, upsetting and upstaging many long-established manufacturers. 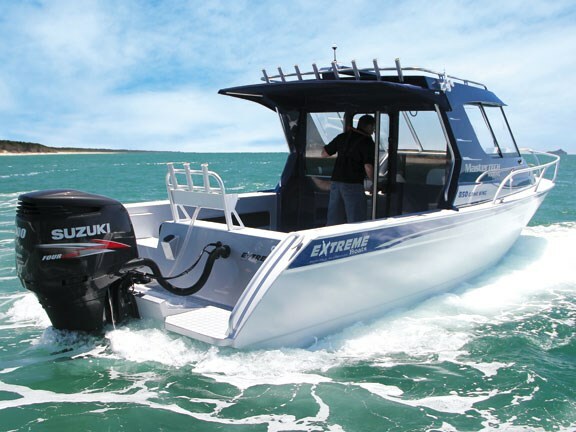 As New Zealand's most awarded aluminium boat builder for the last seven years, Extreme Boats now boasts a sales volume that puts it near the top of the leader board. What's more, Extreme Boats' export market is but a fraction of its competitors. The question, therefore, is why Kiwis flock to Extreme Boats and what is it that Extreme brings to the table that customers find so tempting? In short there is no single easy answer. 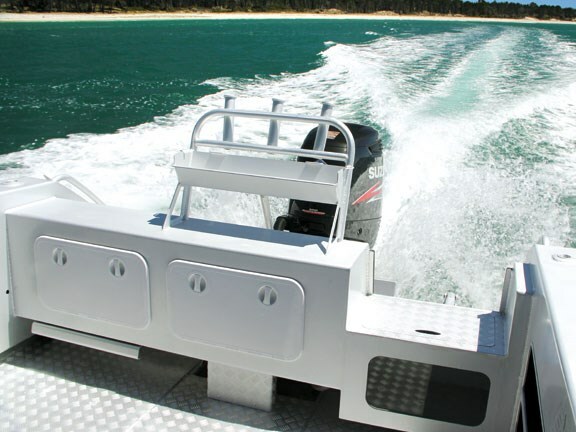 Sure, Extreme Boats' vessels are well built, easy on the eye, practical and well-priced... but so too are a host of other Kiwi-made aluminium trailer boats. The answer lies in part in the brand's freshness and this reflects the results of a major three-year design project that has seen significant changes across the Extreme Boats portfolio. Another factor is Extreme Boats' carefully-timed release of new models from 4.6m to 11m. In a domestic market starved of genuine new releases, Extreme's hard work and timing has paid off and has played into the hands of dealers', buyers' and boat show judges' looking for something new and exciting to sink their teeth into. Conversely, a good number of manufacturers with solid reputations have chosen instead to hunker down and ride out the financial crisis by sticking to their knitting, avoiding the temptation to risk capital and time with new designs that may or may not hit expected sales targets. But Extreme Boats' success goes further and hinges to a degree on an enterprise founded and managed on proven business principles, where product marketing and reinvestment in automation and plant are drivers for growth and productivity. It is not surprising, therefore, that the business recently added a regional commerce award to its trophy cabinet. The company has recently created further options to expand and grow, moving to purpose-built premises on 12 acres of prime Eastern Bay of Plenty land. The shift allows every aspect and component of manufacturing to now be brought in-house for improved quality control. Extreme Boats' founder and managing director Glenn Shaw says keeping product in front of the public is the key to success, and says this is achieved through targeted marketing and an effective dealer network. Maintaining broad appeal has also worked in Extreme's favour whereas some manufacturers prefer to target a niche select market, occasionally at the risk of excluding the wider boating public. Not so Extreme Boats. It is interesting to note that even though every Extreme model is built to MSA survey requirements, there are few – if any – Extreme Boats currently working in the commercial or charter sectors. With 30 per cent growth year-on-year, Extreme Boats now employs 23 full time staff and is on track to turn out 150 boats in the current calendar year. "We're happy with where we're at and where we're headed," says Shaw. "We made some big decisions three or four years ago and we've continued to grow our presence. But we take nothing for granted. There is no substitute for hard work and strategic planning." While technically slotting into Extreme Boats' production range, the 850 Game King is, by its size, a custom build with buyers' tending to specify a higher level of fit-out and broader specification to suit some quite specific boating applications. For this reason the 850 build-process falls to a small specialist team of fabricator/welders within Extreme Boats' greater workforce, each with the experience and vision to deliver what buyers' want without getting bogged down in the detail. The benefit is a boat that shows all the hallmarks of a professional build, with clean, uniform welds, crisp aluminium sheet folding and an obvious attention to detail at every stage of the manufacturing process. The Extreme 850 Game King is technically oversize, with a beam of 2.824m and as such requires oversize flags to be carried. Its girth also requires nerves of steel if you're planning on towing it through congested, built-up areas. However, it is the 850's broad beam and the internal volume that this provides that makes the Game King something of a crossover between a fully-fledged launch and a trailer boat. Aesthetically, the Game King's width allows for an extended cabin hardtop without any impact on aesthetic value. Look at the pictures and it's hard to argue that everything is very well proportioned. 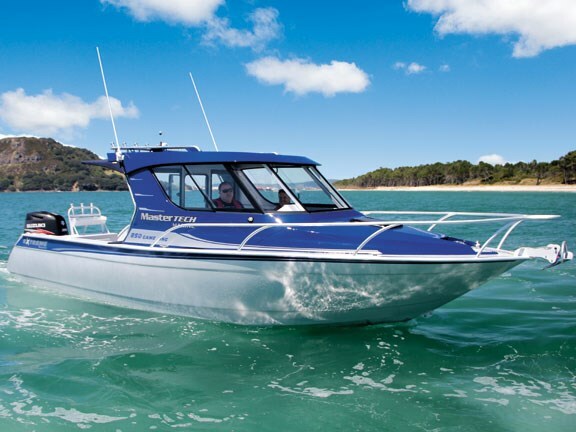 This particular boat – supplied and owned by Tauranga-based Mastertech Marine director Karl Rastrick – has few tick-box options other than squabs, exterior paint and a basic electronics package. But even in standard spec' it's an eye-catching rig and a genuine turn-key package. This is not Rastrick's first Extreme 850 either – and given the boat has just sold – it is unlikely to be his last. He makes no apology for returning to the same model. It's a boat that he says encapsulates the best of what Extreme has to offer. With few frills, the cockpit is as you would expect. It's wide, large and well finished with a simple yet practical layout that lends itself primarily to angling. The tread plate cockpit sole feels solid underfoot and offers up a large under-floor fish/dive bin on the centre-line. While there's nothing unique in this, what is different is the solid welded tangs on the inside of the hatch lid that function as bullet-proof hinges, without the requirement for any fastenings that tend to seize or vibrate loose in the fullness in time. Poke around and you'll find this method of fastening used extensively throughout the boat; it's a great feature. The Game King's Portofino-style transom adds a shapeliness to the boat's aft sections with gently curved stern quarters that meld into the boat's twin boarding platforms. Designed to carry a single or twin outboards, the transom pod is necessarily wide, but this can be resized as a factory option. Climbing aboard the 850 Game King from the rear is stress-free thanks to the robust aluminium boarding ladder that swings over the port-side boarding platform. The twin platforms are wide and deep enough to cater for divers and anglers. Primary access to the cockpit is via the port side walk-thru which forms the boat's live bait tank. The tank is fitted with a window for keeping tabs on your catch. 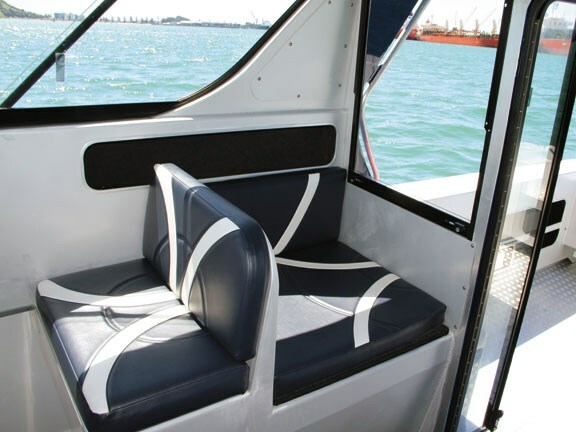 As is standard for an offshore boat, the walk-thru is secured with a simple drop-in alloy board that, when not in use, locates into cleats up under the transom. The boat's bait station is solid and practical but being welded to the transom it's not likely to suit those looking to tow skiers or water toys. Nor is the board's deep trough going to be much use when filleting fish, but your bait certainly isn't going anywhere. With three rod holders on the transom, three on each gunwhale and eight on the overhead rocket launcher, there's no shortage of rod storage. But there is a wee niggle – accessing the rocket launcher with the aft bimini in place is nigh on impossible. In all likelihood the rocket launcher will rarely be required, but it if is then something has to give. On the upside, the 850's twin cockpit shelves are deep, creating a lot of useful storage. They're also solid, providing a safe step-up to the gunwhale when venturing to the foredeck. Inappropriate perhaps in 'boating-speak', the Extreme 850 Game King has excellent indoor/outdoor flow with its central aluminium bi-fold cabin door, flanked by cockpit windows that disappear into cavity sliders. With the rear door folded open and the aft windows down, the boat takes on a very different persona effectively bringing the outdoors in. This is not unique or original on this type of craft, but it works extremely well and is an effective use of space. The other key advantage of a bi-fold door is that it allows useful storage bins to be fixed against the aft cockpit bulkhead. For serious anglers this provides an ideal place to fit a cockpit fridge or freezer unit, or perhaps a removable chilly bin. Upon entering the hardtop, the 850 Game King feels spacious and open with an interesting layout that provides a mix of forward-facing and athwart seating, and a useful raised dinette that makes the most of the boat's picture windows. Depending on conditions, the Game King will comfortably seat five within the hard top, and up to seven at a squeeze. The seating is formed by large fabricated aluminium box structures securely welded to the hull. Not only does this create myriad seating options, it provides a huge amount of dry storage within. The flow from hardtop to cabin is equally open and easy, thanks in no small part to the angled back-dash that cleverly and effectively provides full headroom at the cabin companionway. The helm station bulkhead extends across a third of the boat's beam, so access into and out of the forward cabin is very straightforward. With a large infill squab creating a comfortable full-length double berth, and with an electric toilet plumbed beneath, the 850 Game King is a genuine 'extended weekend' proposition. Cabin stowage is plentiful with twin upholstered parcel shelves and deep dry-lockers under the squabs. The level of finish within is impressive. All internal aluminium surfaces including the internal cockpit structure have been protected with Nyalac, and the colour-matched upholstery throughout is smart and practical. There are numerous, well-placed handholds for seated and standing passengers. A minor negative is the absence of any form of foot brace on the passenger side and a lack of lateral seating support which will tend to require passengers to stand when things start to cut up rough. It is an easy fix. What was pleasing to see was the use of a raised bridge deck between the cockpit and hardtop, and hardtop and cabin. The helm station is simply laid out with an angled aluminium facia providing two faces for mounting flush-mount instruments. It's large enough for big screen instruments but exposed to windscreen glare without any effective form of shading. The seating, wheel and throttle position is natural and comfortable and there's a handy stowage pocket for personal effects. Headroom is in keeping with the boat's generous size and provides for overhead flush mounting of radio gear in an enclosed unit – again, tidy and considered design. All up the internal design and build quality of the 850 interior is impressive. The safety glass side and rear windows open and close securely and the curved polycarbonate corner panes in the windscreen are all well fitted and stylish. The bi-fold rear door locks back positively on rubber catches but is to my mind quite lightly built for blue water work. So too is the front cabin top hatch which I suspect could be found wanting in a green breaking sea. Both are fine for coastal work but offshore anglers might consider alternative options at the beginning of the build stage. Extreme Boats' hull designs are identical across the range and are based on the brand's original Scott Robson hull design. Features include a fine forward entry, full shoulders at maximum beam, wide flat chines aft and a 20 degree transom deadrise – one of the deepest in its class. This, on paper, provides a balance between high speed performance and stability at rest, while the aft chines promote tracking and stability on the plane. The 850 Game King also carries a self-flooding keel cavity to increase displacement at rest. A big boat deserves a big outboard and Karl Rastrick didn't hesitate to mate his new 850 Game King with a new-generation DF300 four stroke outboard featuring Suzuki's new 'lean burn' technology. Launching from Tauranga's Sulphur Point public boat ramp on a clear and calm spring morning, today's only challenge was to stay out of the sun. There was nothing by way of a ground swell or chop to gauge the boat's manners. Suffice to say the big Suzuki made easy work of lifting the 850 effortlessly out of the hole and onto a comfortable plane without excessive throttle and fuel burn. While fitted with trim tabs, these were redundant, though engine trim had a marked effect on fuel economy and ride. What we could conclude was the boat's easy transition back off the plane. While some deep V boats tend to bury their transom when the power comes off, the 850 did not and settled quickly on an even keel. The Game King also holds plane very well and tracks nicely with a positive if not slightly too firm helm. The boat's fine entry bow and broad chines aft equate to lots of grip in tight looping turns and Suzuki's large diameter prop ensures prop cavitation is minimal when trimmed well in. The boat rides nicely and has no obvious vices that I could detect. Rastrick has seen his fair share of weather in his previous 850 and says he's feels completely confident and at ease with boat's sea-keeping abilities in a variety of conditions. "It's a great all-round boat. It's simple, practical and strong. Almost every fitting is welded to the cockpit, deck and superstructure so there's a total absence of annoying rattles, creaks and bangs when pushing hard into a chop. Ride quality is excellent. Sure, it's an aluminium hull and there's hull slap as you'd expect but the ride itself is great. It's also a very dry boat." With just 10 minutes on the engine we avoided the temptation to push the new Suzuki too hard on her maiden outing but at a comfortable 4000rpm the 850 pulled 26 knots, sipping 1.4-litres of fuel per nautical mile. With the boat's 360-litre fuel tank, the Game King will not be compromised by range. I liked this boat a lot. Construction quality and finish has come a long way in a relatively short time and attention to detail is evident throughout. The internal layout is fresh and practical from a family boating perspective and offers up options for 'extended weekend' boating. The Game King also looks smoking hot and stands out like a cat among pigeons. At its stated 3400kg (lightship) on trailer and over-size beam, the 850 is a big rig and will require a substantial tow wagon. Launching and retrieval, however, need not be overly challenging if you're competent and prepared to drive the boat onto its self-catching trailer. Rastrick made this look like child's play. With a little practice there's no reason you couldn't do the same. That said, towing this rig will be demanding in some environments, but this is no reflection on the boat itself. Supplied by: Mastertech Marine Ltd. 60 Whiore Ave, The lakes, Tauriko, Tga. Tel (07) 579 4240 email: karl@mastertech.co.nz or visit online: mastertech.co.nz.